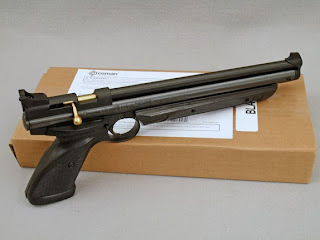 Archer on Airguns: Crosman Factory Refurbished 1377 Air Pistols are Great Vaue. Crosman Factory Refurbished 1377 Air Pistols are Great Vaue. Archer Airguns has a limited supply of factory refurbished Crosman factory 1377 air pistols available in stock. These versatile and popular multipump pneumatic air pistols carry a 30-day Crosman warranty. Most of the ones we have are fitted with black grips and look very smart, they're all in .177 caliber. Refurbished products are ones that have been returned to Crosman during the warranty period. Many - possibly most - have nothing wrong with them at all but are returned for some unknown reason. All are tested by Crosman staff. If a problem is found, this is rectified: the guns are retested and offered for sale as refurbs. Typically physical condition is either "as new" or "near new", but occasional products will have slight signs of handling or use marks. As with any refurbished product, supply of the Crosman 1377 is variable and these are unlikely ever to be a continuously stocked line. We have them available when Crosman has supplies. So buy while these are available, at the price, they're a great deal!